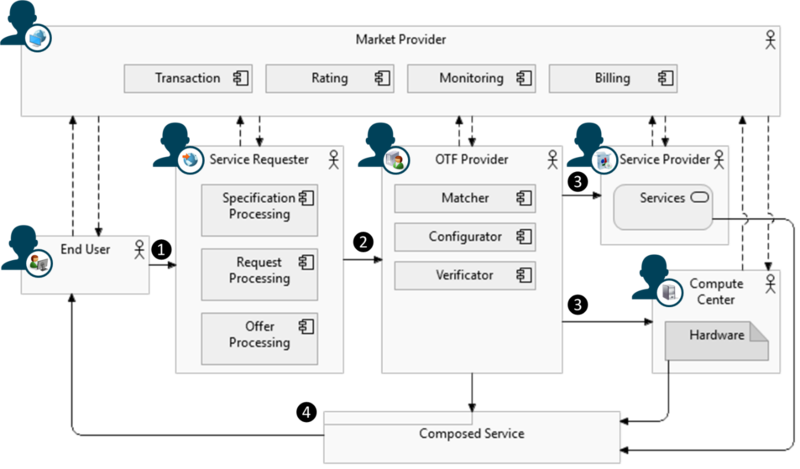 On-the-fly computing (OTF) markets are complex systems that provide customized IT services to individual user requests. Various components like OTF matcher and service composer work hand in hand with a strict coordination to enable on-the-fly service provision from the request to the final service delivery. An enhanced understanding of the complex architecture of OTF markets is required to create these systems successfully and efficiently in the future. The goal of subproject C5 is to form a unified architectural knowledge base for OTF markets by developing an architecture framework that defines the main architectural building blocks and their interactions with human actors. The architecture framework can be used to create instances of OTF markets in different application domains, while quality of the designs can be checked with respect to the quality criteria of the architecture framework. The goal of this subproject within the collaborative research center is to identify architectural characteristics of OTF markets by generalizing the knowledge gained during the first funding period and by investigating existing OTF-like markets (bottom-up). The result is in form of an architecture framework for OTF markets that facilitates systematic development of these systems in the future. Markets provide the socio-economic, technical, and legal infrastructure for transactions, which usually pass through the phases information, trading, matching and settlement. This also applies to OTF markets. Specifically, the following three attributes are characteristic for OTF markets: a) IT services are developed and traded electronically, b) The IT services are composed of several individual services, and c) The IT services are experience goods. These fundamental characteristics of OTF markets need to be realized in any OTF market. The architecture framework developed in the subproject C5 is to ensure the fulfilment of these characteristics in OTF markets that are created for different purposes and in different application domains. Examples of variants of OTF markets are public and intra-company (a.k.a. in-house) markets. Furthermore, examples of application domains are mobile app, enterprise application, and cloud computing. Figure 1 shows the main building block of the architecture framework as model structure, behavior, and variability at different levels, in particular business, application, data, and infrastructure. One of the core parts of the framework is a product line, which encompasses the variabilities of architectural design decisions of OTF and OTF-like markets in different domains. Such variabilities are represented by using feature models. The variabilities include the design decisions from four different viewpoints, i.e., business, application, data, and infrastructure. While the variabilities allow market providers to design markets in different application domains, we identify groups of architectural constraints in order to assess the fulfilment of quality goals by the market architectures. With this respect, an OTF market as a whole is considered to be an ecosystem of human actors and software features. The quality of such an ecosystem is a key factor for market success. Accordingly, the architectural design of OTF markets are assessed with regards to the quality of their ecosystem. Example of quality attributes are business scalability, robustness, and performance. Thus, the architectural design of an OTF market becomes valid if all quality constraints are fulfilled. In C5, the groups of constraints are developed under the concept of design patterns. The results are three major patterns for OTF-like and OTF markets, i.e., Resale Software Ecosystem, Partner-based Software Ecosystem, and Open Source-based Software Ecosystem. 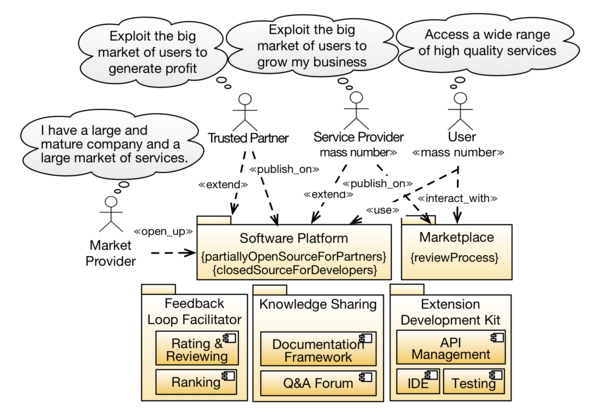 Each pattern maps an architectural design to the key quality attributes of software ecosystems. For example, Figure 2 depicts the architectural landscape of a resale software ecosystem. This pattern helps the market provider to manage the membership of a large community of service providers. The software features such as Rating & Reviewing help to ensure discoverability of high quality services among the large amount of available services. In general, the arrangement of human actors and the choice of software features in this pattern will enable the market provider to achieve business scalability. By checking the conformance of a market architecture with respect to this pattern, the market provider can determine at the design level whether the market fulfills business scalability. Furthermore, in addition to the main building blocks discussed above, markets provide the socio-economic, technical and legal infrastructure for transactions, which usually pass through the phases information, trading, matching and settlement. This also applies to OTF markets. Specifically, the following three attributes are characteristic for OTF markets. IT services are traded electronically. Whereas in the past financial products, commodities and services were increasingly traded on electronic markets, OTF markets aim at IT services that will be electronically traded in the future. On the one hand, the expected heterogeneity of the IT services (from both point of views a functional and non-functional perspective) is challenging, as well as on the other hand the identification of appropriate pricing mechanisms for such IT services (e.g., list prices, auctions, prices which depend on features of the IT services or the customer, pay-per-use or free ad-financed IT services). The IT services are composed of several individual services. Composed services enable the reuse of frequently requested and/or standardized components of an IT service and at the same time allow for addition new, individual services. The essential functions of an OTF Market are the search, matching, composition, verification, execution and monitoring of IT services. Both the composition of existing services and the development of new services involve various market participants. The IT services are experience goods. Experience goods are characterized by the fact that the customer or end user cannot determine the quality until consumption or use has been completed. This property also has IT services on OTF markets as they are individually configured and configured for the end user. Since IT services on an OTF Market may consist of several individual services, the quality of such composed services can be difficult to ascertain in advance. Through rating systems, end users can make use of the experience gained in the past with other market participants or the IT services they already used. This leads to learning effects, which also have an impact on the behavior of the market participants in demanding IT services. (1) The End User requests a service by creating a requirement definition for the service and addressing it to the Service Requester. (2) The Service Requester receives the requirements definition and process it into several technical specifications that can be used within the OTF Market. (3) The OTF Provider selected by the service requester is now looking for appropriate Service Providers that provide services as well as Compute Center, which provide the hardware resources necessary in the execution environment. (4) The OTF Provider provides the compiled service to the end user. This is one possible form of a processed transaction in an OTF market. Numerous other variants (e.g., a direct request by the End User without using a Service Requester) are conceivable. Extensions to the described functioning of OTF markets are already being discussed in numerous directions (for example, public or intra-company OTF markets). Also, the architecture framework’s objective is to enable specific OTF markets to be instantiated for various domains (such as OTF markets for mobile apps or cloud services).